Two significant changes in QuickBooks 2011 are the Quick Startup feature (which improves the startup speed for QuickBooks) and the Multiple Instances feature (allowing two company files to be open at the same time). I’m recommending that you be cautious with these features until you understand the impact they will have on your use of QuickBooks. When some people saw this listed as one of the improvements they let out a loud “Hallelujah”. Many people have been asking for the ability to open two or more QuickBooks company files at the same time. Is the multiple instances feature of QuickBooks 2011 the feature we have been waiting for? I’m afraid that many people will be disappointed. We’ve been able to open two company files at the same time before this, but with big restrictions. You can open a QB 2010 file and then another file of another year, no problem. But not two files of the same year. I use VMWare virtual machines quite a bit to have multiple copies of QuickBooks open at the same time, but that is technically complicated to set up and it doesn’t work well unless you have a very high powered computer (lots of RAM, lots of disk storage, 64 bits, and so forth). Then there is the ever popular option of just having two computers on at the same time. So, now comes QuickBooks 2011 and the Multiple Instances feature. Note that this feature is only available in QuickBooks Enterprise 11.0 (any edition) and QuickBooks Premier Accountants Edition. If you have a QuickBooks 2011 company file open you can start a second copy of QuickBooks at the same time. The first will be called your Primary file, the second your Secondary file. This is exciting! Well, it is, until you find out that there are restrictions to what you can do. The restriction that can be really tricky is the first – not being able to use applications that use the QuickBooks SDK. Many businesses rely on SDK based applications to provide vital features and functions, and you won’t be able to use any of these if you have two company files open. QuickBooks Messenger only works with the primary file. Updated 10/05/2010: For ProAdvisors we have another restriction. If you open a company file with Enterprise 11, and then a second company file with Premier 2011, the file restrictions are in place just as if it was two copies of Enterprise or two copies of Premier. You still have one file set as the primary and the second as the secondary. As I see it, there are two kinds of users who want to be able to work with multiple company files at the same time. Business users may need to manage transactions that relate to two files, making adjustments to inventory or managing bills and payments. In this situation, multiple instance should work. This is a fairly restricted use in that you aren’t doing a lot of management processes. One of the features that is missing in multiple instances is that you don’t have a way to transfer information easily from one company file to another. The other kind of user is an accountant, bookkeeper or someone else who is managing multiple company files for clients. Given the long list of restrictions, and the fact that you can only have two company files open at a time, I believe that the usefulness of this feature is severely limited. As QuickBooks becomes larger and larger, more people complain about how long it takes to actually be able to use the program once you click the icon or Windows menu listing. With the 2011 release (including Pro, Premier and Enterprise) Intuit has come up with a way to speed things up. Looking in your General Preferences you will see a new option, Keep QuickBooks running for quick startups. When this feature is enabled you should notice that the program starts much more quickly. How much faster will depend on your computer system. In my test system the difference was not that noticeable, but I have a very fast computer with lots of RAM and a highly optimized hard drive system. Many factors can come into play – access over a slow network, available RAM, type of processor and more. How do they accomplish this improved start speed? By keeping a portion of the QuickBooks program running as a process even when you exit QuickBooks. On the surface, this seems to be a fairly benign way to resolve the problem for some people. But is it? I have one concern at this point. This takes up RAM (computer memory) and could impact how fast other programs run when you have exited QuickBooks. A portion of the QuickBooks program stays in memory as a “process”, and that consumes computer memory. This memory is then not available to other programs that you may want to run. If you have a computer with a small amount of RAM, or if you are running a large number of programs simultaneously, performance of your compute may be impacted by this option. 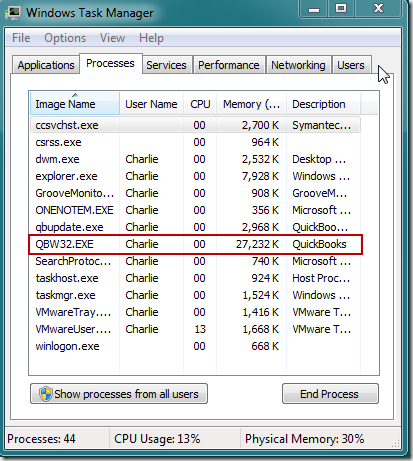 If you look at your computer using the Processes tab in the Windows Task Manager, you see that the QBW32.EXE process stays in memory even when QuickBooks is not running. This happens even if you reboot the computer, although my initial tests show a lower amount of memory being consumed when you reboot, prior to the first time that you run QuickBooks. The good news is that Intuit has made this an optional feature – so we can disable the feature by turning it off in your preferences. I’ve tested this, disabling the feature works very reliably. SO far, after over a month of running with this feature, I haven’t come up with any other issues. I’m assuming that QBW32.EXE is now put into the Windows Startup list? I generally don’t like applications putting themselves there so they run all the time, but if you are in and out of QuickBooks all the time this would probably be a worthwhile time saver. Shannon, there is more to this than I’ve described, but I’m still investigating. 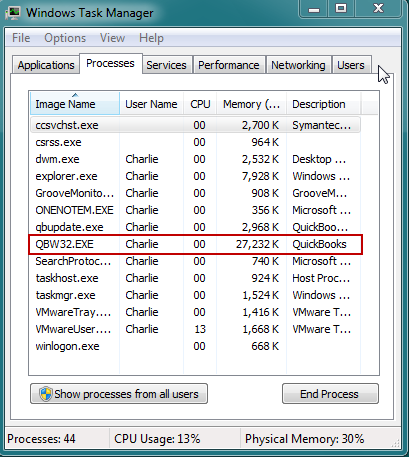 The QBW32.exe service is added to the Windows startup list, REGARDLESS of the setting of this preference. Even if you turn the preference off, you see it in the startup list. You can disable this service in the startup list, and QuickBooks will still run, but it does take awhile to load. If the preference is off, even if the service is still in the startup list, I don’t see it as running once the system has finished rebooting. My own ‘experience’ with the Quick Start-up feature, during Beta testing showed that if you had really large QBW files it significantly improved the load time, but that the time difference wasn’t that noticeable on smaller files. But you can also experience about the same ‘load time’ savings (maybe even better) if you simply do some house-keeping like turning off the ‘load home page’ and ‘load reminders’ (at start-up) as well as ‘save current desktop when existing’; of course many users protest when you try to give them these ‘tips’ to help reduce wait-time. Intuit has indicated that they plan to ‘improve’ the Multiple Instance feature in future releases, much the same way they are incrementally improving the Client Review feature from year-to-year. Let’s hope they do….that will go a long way to making this a viable tool for Users who actually need to ‘work’ in more than one QB file (of the same year) simultaneously. Thanks again Charlie for all you do to keep the rest of us ‘in the know’. For working on my small clients with multiple LLCs, the Multiple Instances WILL be helpful. I just need to check back & forth between companies to make sure that I have captured all the bank transfers, etc. I don’t need anything fancy, just the ability to LOOK at multiple companies without opening and closing, opening and closing. Your example shows Primary and Secondary – can we have a 3rd and 4th company open at the same time? Or are we limited to two companies? Yvonne, you are limited to two company files at this time. Charlie, thanks for digging and finding information that I hadn’t even thought about. I too am concerned about the issues of multi-use and SDK apps. Guess we all are in for a learning curve! Thank you for the list of limitations. Your comments are VERY appreciated. –I work with several small companies and would have liked more. I will continue to my use of opening another client’s file for lookup/informational purposes only.